Those condensation trails in the sky left by aircraft are common, and most of us wouldn’t notice them, but for some, they’re the mark of a secret large-scale spraying program by the government. Well, surprise, no such thing exists (or so the CIA wants you to think). At least, according to science. In a study conducted at the Carnegie Institution for Science at UC Irvine, 77 of the world’s leading atmospheric scientists were surveyed on the subject of chemtrails, with all except one saying they hadn’t encountered any evidence of any secret spraying program. The findings, which were published in Environmental Research Letters, showcase the expert opinions of atmospheric chemists who specialize in condensation trails and geochemists who work on atmospheric dust. 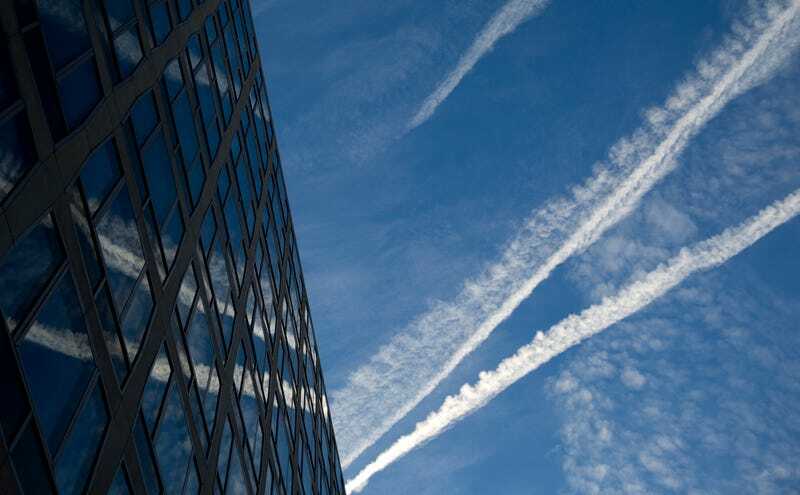 The “spraying” could be explained by other factors, they said, including airplane contrail formation and poor data sampling, along with “well-understood physics and chemistry” associated with the subject. Most of the time, what we see on the ground are contrails from jet engines. Since those engines spew out hot air, which is at odds with the cold, low pressure air high in the atmosphere, creating condensation. So what does cause those trails to last for several hours? According to Ken Caldeira, an author on the study, they are most likely contrails from planes, seen with more frequency due to the rise in air travel. He also posits that global warming could be causing them to last longer, as more humidity causes them to linger. The point of the study was to provide an objective bookmark for future research. Caldeira is aware that the research won’t sway anybody who is committed to the conspiracy idea. “I felt it was important to definitively show what real experts in contrails and aerosols think. We might not convince die-hard believers that their beloved secret spraying program is just a paranoid fantasy, but hopefully their friends will accept the facts,” he said. Of course, this could all still be a government cover-up, so don’t take our word for it.